Download "DEFINITIVE ADVICE PRACTICAL GUIDANCE POWERFUL ADVOCACY LLP"
2 European Funds Practice Dechert s international Financial Services Practice features an industry-leading group of experienced lawyers who focus on the structuring, establishment, approval, taxation and management of Europeandomiciled funds. This group, completely integrated within our global team, helps our clients achieve their objectives while maintaining regulatory compliance wherever they do business. Our team advises UCITS and non-ucits domiciled in the United Kingdom, Luxembourg, Ireland, France, Germany and elsewhere, as well as promoters, investment advisers, distributors, administrators and other service providers to European-domiciled funds. 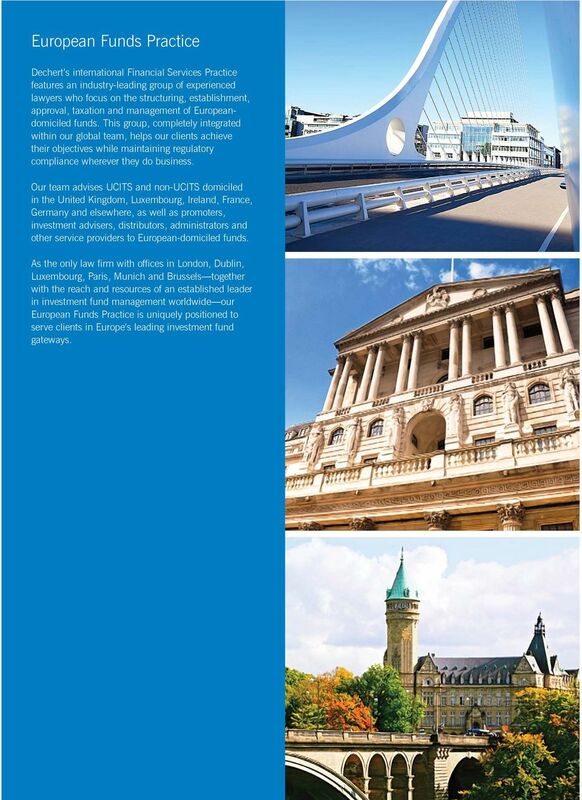 As the only law firm with offices in London, Dublin, Luxembourg, Paris, Munich and Brussels together with the reach and resources of an established leader in investment fund management worldwide our European Funds Practice is uniquely positioned to serve clients in Europe s leading investment fund gateways. 3 An Established Leader Dechert has one of the largest and most distinguished investment management practices in the world. We are a leading advisor on mutual and retail funds, hedge funds, private equity funds, real estate funds, funds of funds, structured debt products and closedend funds, as well as on insurance and derivative products and transactional work. For our clients, this means: Asset managers based in or expanding into and beyond the European fund sector rely on us to identify and understand the complexities of structuring, managing, distributing and servicing UCITS and non-ucits products and their taxation. Fund promoters and distributors marketing European funds into the United States on a private placement basis draw upon our resources and experience to navigate the U.S. regulatory landscape, including with respect to investment adviser, brokerdealer, commodity pool, employee benefit plan (ERISA), tax and other securities law issues. We advise on privately and/or publicly placing interests in openand closed-end funds and products for offer and sale globally. We have an extensive network of offices in the United States, Europe and Asia as well as preferred legal providers covering more than 80 jurisdictions. 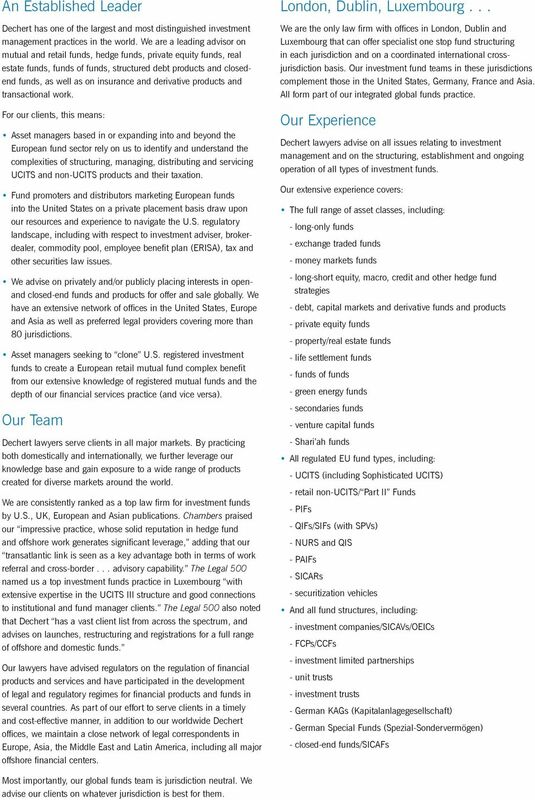 Asset managers seeking to clone U.S. registered investment funds to create a European retail mutual fund complex benefit from our extensive knowledge of registered mutual funds and the depth of our financial services practice (and vice versa). Our Team Dechert lawyers serve clients in all major markets. By practicing both domestically and internationally, we further leverage our knowledge base and gain exposure to a wide range of products created for diverse markets around the world. We are consistently ranked as a top law firm for investment funds by U.S., UK, European and Asian publications. Chambers praised our impressive practice, whose solid reputation in hedge fund and offshore work generates significant leverage, adding that our transatlantic link is seen as a key advantage both in terms of work referral and cross-border... advisory capability. The Legal 500 named us a top investment funds practice in Luxembourg with extensive expertise in the UCITS III structure and good connections to institutional and fund manager clients. The Legal 500 also noted that Dechert has a vast client list from across the spectrum, and advises on launches, restructuring and registrations for a full range of offshore and domestic funds. Our lawyers have advised regulators on the regulation of financial products and services and have participated in the development of legal and regulatory regimes for financial products and funds in several countries. As part of our effort to serve clients in a timely and cost-effective manner, in addition to our worldwide Dechert offices, we maintain a close network of legal correspondents in Europe, Asia, the Middle East and Latin America, including all major offshore financial centers. London, Dublin, Luxembourg... We are the only law firm with offices in London, Dublin and Luxembourg that can offer specialist one stop fund structuring in each jurisdiction and on a coordinated international crossjurisdiction basis. Our investment fund teams in these jurisdictions complement those in the United States, Germany, France and Asia. 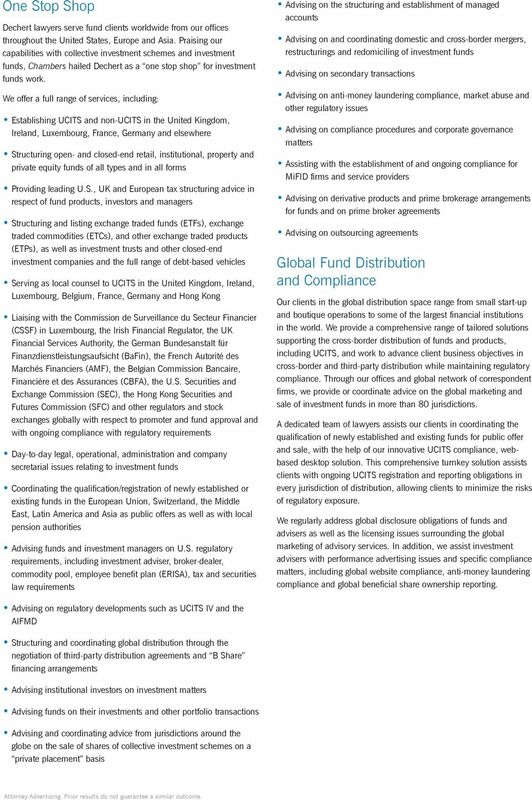 All form part of our integrated global funds practice. Our Experience Dechert lawyers advise on all issues relating to investment management and on the structuring, establishment and ongoing operation of all types of investment funds. Our extensive experience covers: The full range of asset classes, including: - long-only funds - exchange traded funds - money markets funds - long-short equity, macro, credit and other hedge fund strategies - debt, capital markets and derivative funds and products - private equity funds - property/real estate funds - life settlement funds - funds of funds - green energy funds - secondaries funds - venture capital funds - Shari ah funds All regulated EU fund types, including: - UCITS (including Sophisticated UCITS) - retail non-ucits/ Part II Funds - PIFs - QIFs/SIFs (with SPVs) - NURS and QIS - PAIFs - SICARs - securitization vehicles And all fund structures, including: - investment companies/sicavs/oeics - FCPs/CCFs - investment limited partnerships - unit trusts - investment trusts - German KAGs (Kapitalanlagegesellschaft) - German Special Funds (Spezial-Sondervermögen) - closed-end funds/sicafs Most importantly, our global funds team is jurisdiction neutral. We advise our clients on whatever jurisdiction is best for them. 4 One Stop Shop Dechert lawyers serve fund clients worldwide from our offices throughout the United States, Europe and Asia. Praising our capabilities with collective investment schemes and investment funds, Chambers hailed Dechert as a one stop shop for investment funds work. We offer a full range of services, including: Establishing UCITS and non-ucits in the United Kingdom, Ireland, Luxembourg, France, Germany and elsewhere Structuring open- and closed-end retail, institutional, property and private equity funds of all types and in all forms Providing leading U.S., UK and European tax structuring advice in respect of fund products, investors and managers Structuring and listing exchange traded funds (ETFs), exchange traded commodities (ETCs), and other exchange traded products (ETPs), as well as investment trusts and other closed-end investment companies and the full range of debt-based vehicles Serving as local counsel to UCITS in the United Kingdom, Ireland, Luxembourg, Belgium, France, Germany and Hong Kong Liaising with the Commission de Surveillance du Secteur Financier (CSSF) in Luxembourg, the Irish Financial Regulator, the UK Financial Services Authority, the German Bundesanstalt für Finanzdienstleistungsaufsicht (BaFin), the French Autorité des Marchés Financiers (AMF), the Belgian Commission Bancaire, Financière et des Assurances (CBFA), the U.S. Securities and Exchange Commission (SEC), the Hong Kong Securities and Futures Commission (SFC) and other regulators and stock exchanges globally with respect to promoter and fund approval and with ongoing compliance with regulatory requirements Day-to-day legal, operational, administration and company secretarial issues relating to investment funds Coordinating the qualification/registration of newly established or existing funds in the European Union, Switzerland, the Middle East, Latin America and Asia as public offers as well as with local pension authorities Advising funds and investment managers on U.S. regulatory requirements, including investment adviser, broker-dealer, commodity pool, employee benefit plan (ERISA), tax and securities law requirements Advising on the structuring and establishment of managed accounts Advising on and coordinating domestic and cross-border mergers, restructurings and redomiciling of investment funds Advising on secondary transactions Advising on anti-money laundering compliance, market abuse and other regulatory issues Advising on compliance procedures and corporate governance matters Assisting with the establishment of and ongoing compliance for MiFID firms and service providers Advising on derivative products and prime brokerage arrangements for funds and on prime broker agreements Advising on outsourcing agreements Global Fund Distribution and Compliance Our clients in the global distribution space range from small start-up and boutique operations to some of the largest financial institutions in the world. We provide a comprehensive range of tailored solutions supporting the cross-border distribution of funds and products, including UCITS, and work to advance client business objectives in cross-border and third-party distribution while maintaining regulatory compliance. Through our offices and global network of correspondent firms, we provide or coordinate advice on the global marketing and sale of investment funds in more than 80 jurisdictions. A dedicated team of lawyers assists our clients in coordinating the qualification of newly established and existing funds for public offer and sale, with the help of our innovative UCITS compliance, webbased desktop solution. This comprehensive turnkey solution assists clients with ongoing UCITS registration and reporting obligations in every jurisdiction of distribution, allowing clients to minimize the risks of regulatory exposure. We regularly address global disclosure obligations of funds and advisers as well as the licensing issues surrounding the global marketing of advisory services. In addition, we assist investment advisers with performance advertising issues and specific compliance matters, including global website compliance, anti-money laundering compliance and global beneficial share ownership reporting. Advising on regulatory developments such as UCITS IV and the AIFMD Structuring and coordinating global distribution through the negotiation of third-party distribution agreements and B Share financing arrangements Advising institutional investors on investment matters Advising funds on their investments and other portfolio transactions Advising and coordinating advice from jurisdictions around the globe on the sale of shares of collective investment schemes on a private placement basis Attorney Advertising. Prior results do not guarantee a similar outcome. 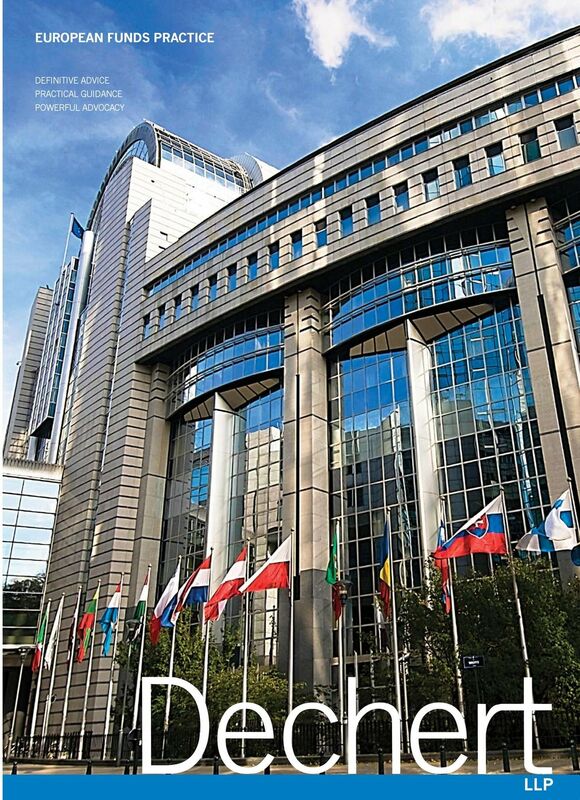 5 European Funds Practice Dechert s international Financial Services Practice features an industry-leading group of experienced lawyers who focus on the structuring, establishment, approval, taxation and management of Europeandomiciled funds. This group, completely integrated within our global team, helps our clients achieve their objectives while maintaining regulatory compliance wherever they do business. Our team advises UCITS and non-ucits domiciled in the United Kingdom, Luxembourg, Ireland, France, Germany and elsewhere, as well as promoters, investment advisers, distributors, administrators and other service providers to European-domiciled funds. As the only law firm with offices in London, Dublin, Luxembourg, Paris, Munich and Brussels together with the reach and resources of an established leader in investment fund management worldwide our European Funds Practice is uniquely positioned to serve clients in Europe s leading investment fund gateways. One Stop Shop Dechert lawyers serve fund clients worldwide from our offices throughout the United States, Europe and Asia. Praising our capabilities with collective investment schemes and investment funds, Chambers hailed Dechert as a one stop shop for investment funds work. We offer a full range of services, including: Establishing UCITS and non-ucits in the United Kingdom, Ireland, Luxembourg, France, Germany and elsewhere Structuring open- and closed-end retail, institutional, property and private equity funds of all types and in all forms Providing leading U.S., UK and European tax structuring advice in respect of fund products, investors and managers Structuring and listing exchange traded funds (ETFs), exchange traded commodities (ETCs), and other exchange traded products (ETPs), as well as investment trusts and other closed-end investment companies and the full range of debt-based vehicles Serving as local counsel to UCITS in the United Kingdom, Ireland, Luxembourg, Belgium, France, Germany and Hong Kong Liaising with the Commission de Surveillance du Secteur Financier (CSSF) in Luxembourg, the Irish Financial Regulator, the UK Financial Services Authority, the German Bundesanstalt für Finanzdienstleistungsaufsicht (BaFin), the French Autorité des Marchés Financiers (AMF), the Belgian Commission Bancaire, Financière et des Assurances (CBFA), the U.S. Securities and Exchange Commission (SEC), the Hong Kong Securities and Futures Commission (SFC) and other regulators and stock exchanges globally with respect to promoter and fund approval and with ongoing compliance with regulatory requirements Day-to-day legal, operational, administration and company secretarial issues relating to investment funds Coordinating the qualification/registration of newly established or existing funds in the European Union, Switzerland, the Middle East, Latin America and Asia as public offers as well as with local pension authorities Advising funds and investment managers on U.S. regulatory requirements, including investment adviser, broker-dealer, commodity pool, employee benefit plan (ERISA), tax and securities law requirements Advising on regulatory developments such as UCITS IV and the AIFMD Structuring and coordinating global distribution through the negotiation of third-party distribution agreements and B Share financing arrangements Advising institutional investors on investment matters Advising funds on their investments and other portfolio transactions Advising and coordinating advice from jurisdictions around the globe on the sale of shares of collective investment schemes on a private placement basis Attorney Advertising. Prior results do not guarantee a similar outcome. Advising on the structuring and establishment of managed accounts Advising on and coordinating domestic and cross-border mergers, restructurings and redomiciling of investment funds Advising on secondary transactions Advising on anti-money laundering compliance, market abuse and other regulatory issues Advising on compliance procedures and corporate governance matters Assisting with the establishment of and ongoing compliance for MiFID firms and service providers Advising on derivative products and prime brokerage arrangements for funds and on prime broker agreements Advising on outsourcing agreements Global Fund Distribution and Compliance Our clients in the global distribution space range from small start-up and boutique operations to some of the largest financial institutions in the world. We provide a comprehensive range of tailored solutions supporting the cross-border distribution of funds and products, including UCITS, and work to advance client business objectives in cross-border and third-party distribution while maintaining regulatory compliance. Through our offices and global network of correspondent firms, we provide or coordinate advice on the global marketing and sale of investment funds in more than 80 jurisdictions. A dedicated team of lawyers assists our clients in coordinating the qualification of newly established and existing funds for public offer and sale, with the help of our innovative UCITS compliance, webbased desktop solution. This comprehensive turnkey solution assists clients with ongoing UCITS registration and reporting obligations in every jurisdiction of distribution, allowing clients to minimize the risks of regulatory exposure. We regularly address global disclosure obligations of funds and advisers as well as the licensing issues surrounding the global marketing of advisory services. In addition, we assist investment advisers with performance advertising issues and specific compliance matters, including global website compliance, anti-money laundering compliance and global beneficial share ownership reporting. ABOUT DECHERT LLP A global specialist law firm focused on sectors with the greatest complexities and highest regulatory demands, Dechert delivers deep legal expertise and practical commercial judgment to our clients most important matters. 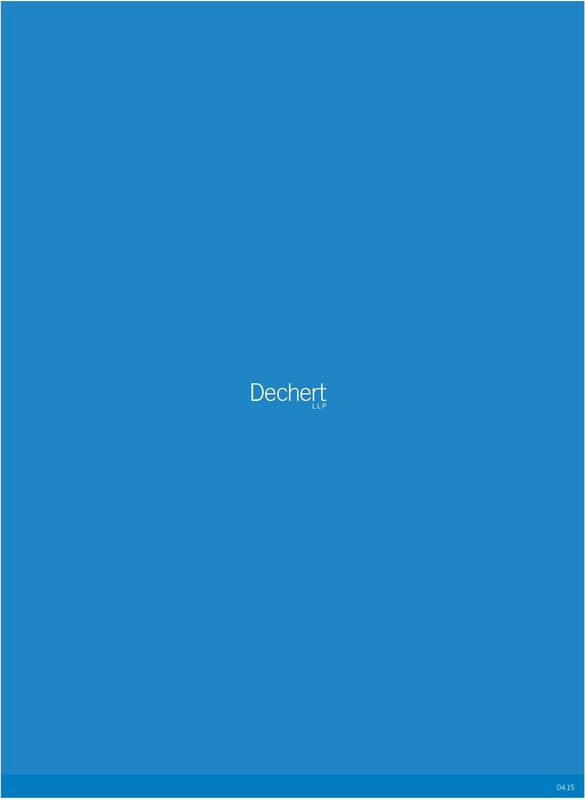 dechert.com. Almaty Austin Beijing Boston Brussels Charlotte Chicago Dubai Dublin Frankfurt Hartford Hong Kong London Los Angeles Luxembourg Moscow Munich New York Orange County Paris Philadelphia Princeton San Francisco Singapore Silicon Valley Tbilisi Washington, D.C.
new york offi ce Latitude N 40 42' 36" Longitude W 74 0 0"
hong kong offi ce Latitude N 22 16' 42" Longitude E 114 9 32"
DATA TRANSFERS WITHIN A MULTINATIONAL GROUP SAFELY NAVIGATING EU DATA PROTECTION RULES MAY 2013 INTRODUCTION Multinational corporations increasingly have a need to share their data throughout their group. INVESTMENT FUNDS. SEC Proposes First Dodd-Frank Investment Advisers Act Rule to Address Family Offices. What Is a Family Office? Property authorised investment funds (PAIFs) where are we going? Capital Market Linkages: How to facilitate cross border trading? Greater China Practice Pillsbury helps connect China s leading companies to the world and the world s leading companies to China. French Employment Law: Your Questions, Our Answers Discover (or Rediscover) French Employment Law: Your Questions, Our Answers 2015 2016 Edition d About Dechert Dechert is a global specialist law firm.